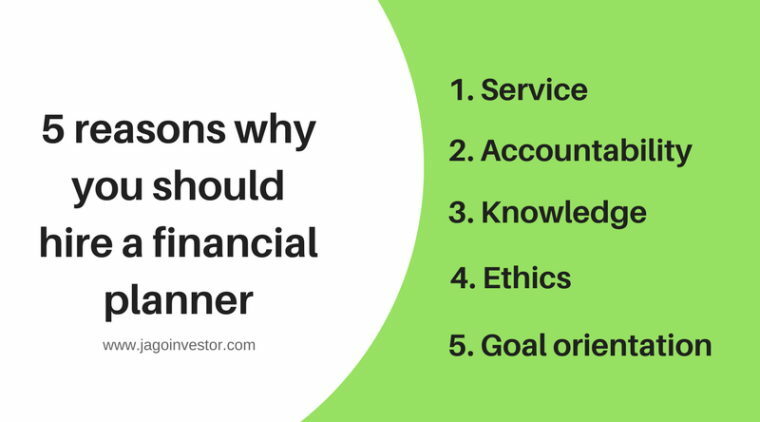 5 reasons why you should hire a financial planner? As a concept ‘financial planner’ has been in existence over several decades in the western world and in modern times, this role has turned into a well understood and highly regulated profession. In the developed markets Financial planners would be similar to the family GP (general practitioner or family doctor) advising their clients on money matters ranging from buying into real estate to making of wills and estate planning. In India though the concept, as it is understood in the west, is yet to arrive; we always did plan our finances well. This was, however, done by a variety of means. For instance, we took advice of friends and family members before finalizing the property deal; we asked colleagues for a reference to persons who could provide us the financial product that we wanted to invest in. We also were chased by individuals who would specialize in selling a particular product (Common mistakes in Personal Finance). It could have been insurance, tax planning products, loans etc. In most events there was significant mis-match between what we wanted and what we got. The products would service most but not all requirements of the problem we had. This has been changing over the past 5-7 years with the emergence of financial planners. These individuals/firms approach in dealing with client’s financial problems is more integrated than what most of the firms offer in India today. You can also watch this video to know the Financial services by Jagoinvestor. This is the most fundamental part of any financial planner. Since when you hire a planner and he charges you fees, individuals can expect a very high level of personalized service from the firm/planner. This serves several purposes. It frees a significant amount of time that you invest in doing research for investment/ financial products. This in-turn helps you choose the right financial product/service. By far this is the most important reason to hire a financial planner. Over the past few years, there have been a plethora of financial products that got manufactured and a significant of those that got invested into were sold by individual/firms who were and are not held accountable for promise and performance. There has been a wide gap between these and it continues to be easy to get away after completing the transaction without any recourse to the agent/intermediary for non-performance. ‘Caveat-emptor’ or buyer beware is applied on majority of financial products. A financial planner and his engagement is a multi-year one and rest assured that chances are that more often than not you can demand an answer and check back on promise and performance of the financial product sold. In fact, the planner of today in India is the one that keeps clients updated on what has been the periodic performance of his/her investments. There has been a sea change in the financial landscape in India over the past 10 years. Financial products that got manufactured in India have increased in complexity and oft border on the esoteric fringe. A planner endures that he is updated on the latest happenings around him and is expected to do two things – guard his client into signing on against anything which is not in his/her interest and select products which though not understood well but suit and serve the purpose and his financial goals. Both of these activities require a deep understanding of the markets and products per se. In addition, global certifications such as the CFPCM (Certified Financial Planner) provide the added comfort that the individual has done enough homework before he takes fiduciary responsibility of your funds. This is easy to understand and preach but difficult to find and practice. Here is where the difference can be stark and contrasted. Financial planners who have demonstrated business ethics and integrity will remain a standout. Because of the esoteric nature of quality involved in testing the planner whether he is ethical or not, the test can be done by simply asking questions such as – What process does he follow in taking and dealing in funds? What is the quality of people he employs at this firm? How long has he been in the business? How has he grown the business? – references, ads etc. Answers to questions such as these will provide you with a fair degree of things such as Ethics, honesty et el. Not the least of them and equally important is the ability of the current planner to being goal oriented and inculcating a habit of financial discipline into the client’s psyche. The benefits of this get blurred in the overall scheme of things due to the nature of the long length towards the realization of them. Things like children’s education, marriage or spending for one’s 25th marriage anniversary are events stretched far out in the future and hence not planned for. The planner’s ability to set aside or build funds for these events and the benefit of those would dawn upon when the events arrive over the short horizon. Hi, I am Amit kumar of 26 yrs from rajasthan.I am a govt.employee with a monthly income of 25,000.I am having two LIC ENDOWMENT plans of which one is of sum assured 6 Lk and a annual premium of 28000 and other with a sum asssured of 1 Lk and a annual premium of 6000.I am also having 2 ULIP plans of which one is LIC MARKET PLUS (optioned GROWTH) with annual premium 10000 and other is ING VAISYA (optioned GROWTH) with a annual premium of 4000.There is also a deduction of 10% from my monthly salary under contributory pension scheme(C.P.F.). I have started up with a monthly SIP of 1000 in canara robeco equity tax saver(growth) last month.now i am planning to open a PPF a/c wid SBI.i am also planning to invest in two equity diversified MFs wid monthly sip of Rs 1000 each. I request u to plz analize my above portfolio and suggest me two or three good equity diversified MFs.I am having a goal of 7 Lk after 5 yrs.I also want to know that as i am having C.P.F. deduction whether i should open P.P.F. a/c or not. plz mail me. You should consider using the calculators given at the top to plan your finance , also please look at the list of funds in my article , see archives . I have been a regular visitor for quite some time now, but never replied. The articles are simple and easy to understand. I learnt it all in the hard way, lost quite a lot in stocks(immaturity at the age of 22), quit for few years and came back in MFs for the last 3 years. Got around 5-6 friends to go for term + MF (SIP) route, and all are happy so far. I try educating them through your articles. Good Work. Wow .. thats really an amazing comment 🙂 . I am glad that the articles are helping you and your friends, which city are you in ? I am in Bangalore now. Manish, I am new to the investments, and planning. How you think about SIP? Or are there any other better options? I can not spare much amount as of now, but I am thinking of making some good use of what I have with me. Please advise. SIP are good vehicles for long term , Start SIP in balanced funds as of now if you are a starter . Thanks for info. I was contacted by the Bank regarding the SIP. What do you exactly mean by balanced funds? Should I go thru any bank, or I can start SIP on my own? You can invest directly by filling up a form available at AMC office , Balanced funds are mutual funds with around 65% money in Equity and rest in fixed income instrument . They are less riskier than pure equity funds . Totally agree that the experts do it better that most of us amatures. Still on the scale of expertise and the values listed, it becomes imperative that he should come up to not desired but needed level. My viewpoint is that the finances being a too touchy subject and ethics not being a commodity – how many of us will be comfortable without really knowing a person. And did I heard a murmur already!! Agreed , Trust factor is the biggest factor i would say . Even though financial planners can do it better than others , but still to connect with financial planners its important to know him , have that wavelength matched with him . This will happen only from references from friends and family , or if you read about them and interact with them . Hi Vinayak, Thanks for sharing such a useful information with us. I really liked the Accountability part. Its one part thats missing in India. Even the fund managers of popular MF houses are not penalized for losses incurred. If the salaries are made totally variable and linked to performance of the fund, the accountability of these planners will definitely improve. We are slowly moving towards that practice but clearly we seem to be at least 5 years away from that, if not 10. In the west, its is customary that the fund manager puts in his own money in the funds he runs and discloses it. Here to we should see this over time. Again, that applies to the planner as well. Check every time if what is being recommended is being invested by the planner himself. Here you would realize that the fancy PE fund the planner has on his recommendation list, he does not have the confidence to invest in it himself. Period. I dont see this thing happening within 5-10 yrs time across the country , may be its true in bigger cities like Mumbai , Bangalore , Delhi , Pune , Kolkatta , Hyd etc , but definately not in smaller cities like Varanasi , Gorakhpur or Vishakhapatnam 🙂 . The way Indians have been buying financial products across country over decades now has so deep rooted and making the advisor accountable is just not possible . DTC coming in next year can change a lot of things in advisory space and if swaroop committee recommendation of “no load” comes in (which is very doubtful) , then we will enter a different world altogether and things will change . @Vinayak , how correct it is to ask financial planners to make accountable for performance of funds and the “financial planning projections” . Is there any case or situation when risk of Equity performance can be shifted from Equity asset class itself and shifted to financial planner ? There is no double that personal finance planner can be quite helpful in certain situations. But I’ll encourage that everybody should also learn at least basics of Personal Finance and should try to manager his finance himself (‘Personal Finance’). Also, if you hire finance planner, it should be the responsibility of the planner to educate you. Well, I hired a planner last year but unfortunately, my experience was not good and I had to cancel my contract. You are absolutely right. You hit the nail on its head. As individuals, we are programmed to run our own households pretty well. Comparing it with the medicine profession, most of the minor problems are treated at home using remedies that are time tested. You nevertheless consult the family GP. It’s akin to that. Nobody understand his/her body better than himself/herself and so its with finances as well. It’s only for professional opinion, pointed financial problems and staying on course for the future. And lastly this guy (planner) can imbibe the discipline into you, cause he is a third party and non-emotional. As Vinayak Pointed out the similiarity between doctor and financial planner , I would say we dont take finances as seriously as medical ailment because its not life threatening directly . Financial problems do not come suddenly in one go because of your bad management and hence it does not trigger our instincts at some particular time . Comparing it with medicine, if you dont take care of your health , suddenly one day you will be diagonised by some ailment and you will panic to doctor in rush . However this does not happen with finances , you worsen your situation by mismanaging your money , underinsuring your self and not utilizing your money to work for your self and slowly it creates problem month by month and year by year and you never get a sudden big stroke , which give a feeling that its not a problem . Imagine retirement planning , As P V Subramaniam points out in his book “Rich retire , Invest” that retirement planning is very difficult and complicated process now a days if one wants to do it successfully . Current generation will cry blood tears in their retirement if they loose all these years of accumulation stage , but later they wont even be able to regret because they have lost all the time . Manish, This is really wonderful description of role of financial planner! May I add that if we be disciplined, without being emotional for our investment decisions, we could do somewhat better that what we are doing!? Can you pls suggest name of some reputed financial advisors.